Port Stealthing is a security feature whereby ports on an Internet connected PC are hidden from sight, evoking no response to opportunistic port scans. General Note: Your computer sends and receives data to other computers and to the Internet through an interface called a 'port'. There are over 65,000 numbered ports on every computer - with certain ports being traditionally reserved for certain services. For example, your machine almost definitely connects to Internet using port 80 and port 443. Your e-mail application connects to your mail server through port 25. 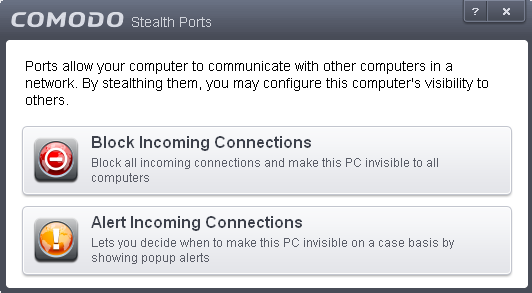 A 'port scanning' attack consists of sending a message to each of your computer ports, one at a time. This information gathering technique is used by hackers to find out which ports are open and which ports are being used by services on your machine. With this knowledge, a hacker can determine which attacks are likely to work if used against your machine. Stealthing a port effectively makes it invisible to a port scan. This differs from simply ‘closing’ a port as NO response is given to any connection attempts (‘closed’ ports respond with a ‘closed’ reply- revealing to the hacker that there is actually a PC in existence.) This provides an extremely high level of security to your PC. If a hacker or automated scanner cannot 'see' your computers ports then they presumes it is offline and move on to other targets. You can still be able to connect to Internet and transfer information as usual but remain invisible to outside threats. Comodo Firewall provides a user with flexible stealthing options. If you would like more information on the meaning and construction of rules, please click here. You see a firewall alert every time there is a request for an incoming connection. The alert asks your permission on whether or not you wish the connection to proceed. This can be useful for applications such as Peer to Peer networking and Remote desktop applications that require port visibility in order to connect to your machine.